“Give it a whirl….it’s Reversible! 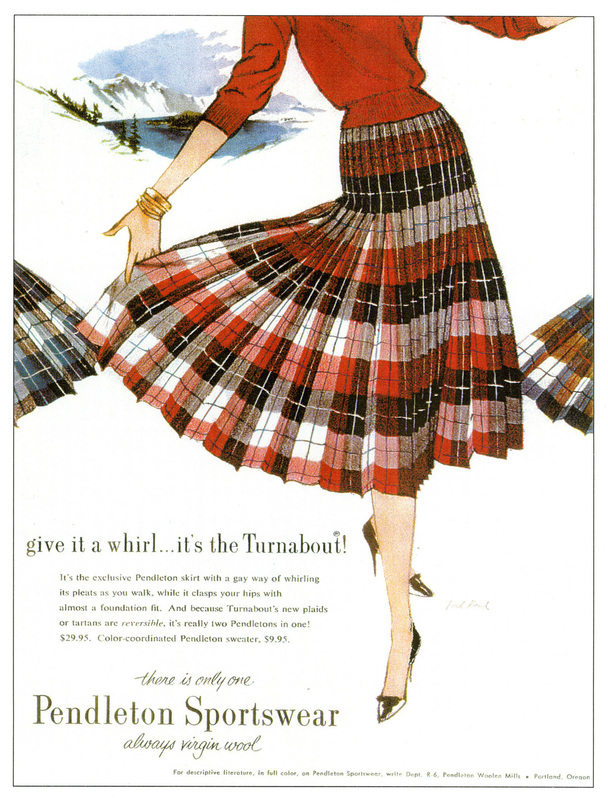 It’s the Turnabout, with a gay way of whirling when you walk.” Pendleton’s Turnabout debuted in 1953, and along with the poodle skirt, it was THE skirt craze of the 1950s. But parents didn’t do all the buying. Summer jobs, babysitting money, berry picking; you did what you had to, to have a Pendleton Turnabout. Perhaps no other garment in fashion history has inspired so much teenage industry. So, where did this innovative garment begin? The idea probably arose from the fact that the interior of a Pendleton pleated skirt is almost as attractive as the exterior, as our weaving is beautiful on both sides of the fabric, and quality construction is our hallmark. There are no design notes, but one of our designers probably noticed how the colors changed on the interior of a skirt, due to the pleating, and started thinking about a skirt that could be worn either side out. A great idea, yes, but to construct a skirt that could actually be worn both ways required tremendous teamwork between designers and engineers. Even the closure and label required a special design. But we worked it out, and the results were part of fashion history. The Turnabout was more than a work of fashion. It was a work of engineering so precise that we had to patent it! Over the years, we used many fabric techniques to achieve variations. By varying the size of the plaids and pleats, we could give the skirts a horizontally or vertically striped effect. Some skirts were woven in bands of herringbone color, for a completely different look. 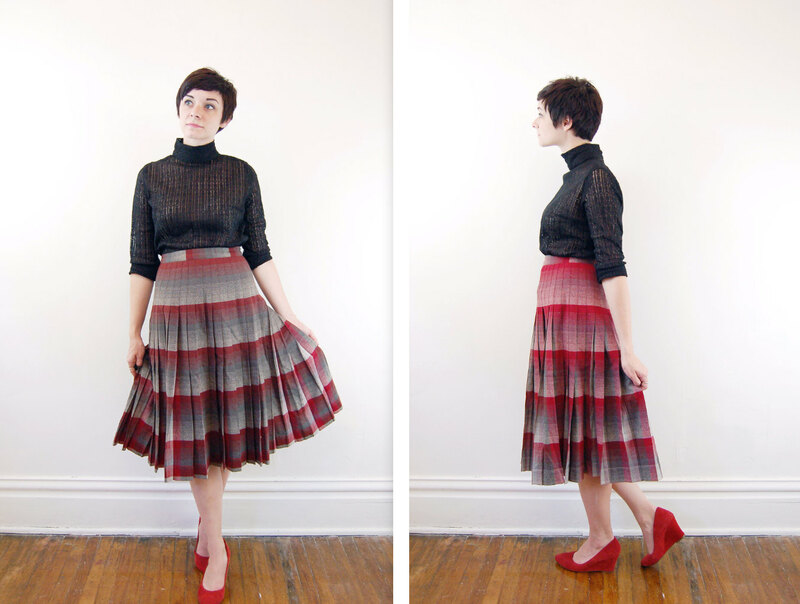 The Turnabout skirt was always a favorite with vintage clothing collectors. Fifty years after the garment’s initial debut, we decided to re-introduce it as part of a Heritage capsule that included the 49’er, the Turnabout (released as ‘the Pendleton Reversible Skirt’) and the River Jacket. Again, a wonderful idea, but there were no production records to refer to after all that time. We had many skirts in our archives, but no records on the actual technique. It took many phone calls to retired personnel and a lot of discussion. After much trial and error, we finally worked out the process. The skirt was tested for Holiday 2002, and re-released for Fall 2013. The Reversible Skirt has stayed in the line ever since. It does not have a paper pattern developed by a pattern maker. It’s constructed with careful planning and engineering by our fabric design and manufacturing personnel. The sizing method is unique; we simply add pleats to each size. The Pendleton Reversible Skirt. Isn’t it time you gave it a whirl? ← Stitch magazine: creating with fabric + thread, and Pendleton, too! My very favorite skirt! I had a red, gray and black one in the late 1950’s, and had 2 Pendleton sweaters to match – a red wool and a gray cashmere. 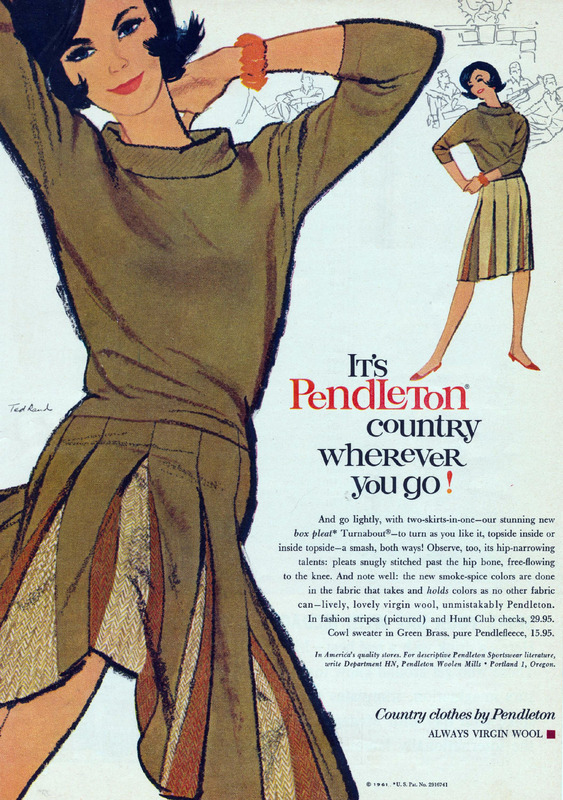 I LOVE Pendleton’s pleated skirts so much, and especially the turnabouts! Got my first Turnabout at the Catlin Gabel Rummage Sale (Portland, OR) in the early 70’s. It was in perfect condition! Wore it through college in Colorado with thick tights, irish cable knit sweaters and my desert boots – a unique but oft admired look. Thx for bringing them back. V flattering to all shapes! Have added 2 more to the original (now too small… waiting for daughters to “discover” in my closet!). Was this the huge Catlin Gabel rummage sale that used to be held at a coliseum? Does that still go on? I have fond memories (and a nice solid oak kitchen table) from that sale in the early 80s. I LOVE my Pendleton turnabout skirt! It is sooo comfortable! I could wear it every day (and just about do in the fall!) ~ The red Reversible skirt on the cover of the fall catalog is just gorgeous. I am so hoping that it is in my size! I also bought one in the 70’s at the Goodwill in Walla Walla, Wa. It was lavender and cream and very pretty! I also bought and still have a black and red plaid little unlined blazer and the classic boxy jacket in burgundy and grey. The quality is so wonderful. They last forever! According to my grandmother, who is 91, it was her mother (my great-grandmother) who perfected the Pendleton Reversible skirt. Is that possible? I believe my grandmother and I know for certain that my great-grandmother worked for Pendleton. I think it was in Omaha, Nebraska. Her name was Martha Dietrich. I would love to know anything more. Hi Melissa. Quite a few people helped with the design and execution of the Turnabout. We had sewing facilities all over the country, including Omaha, during the years your great-grandmother was working. I will do a little research, but whether or not we have documentation that includes her name, she was very definitely in the right place at the right time. Details within a week or so, after a trek to the archives. That sounds beautiful! 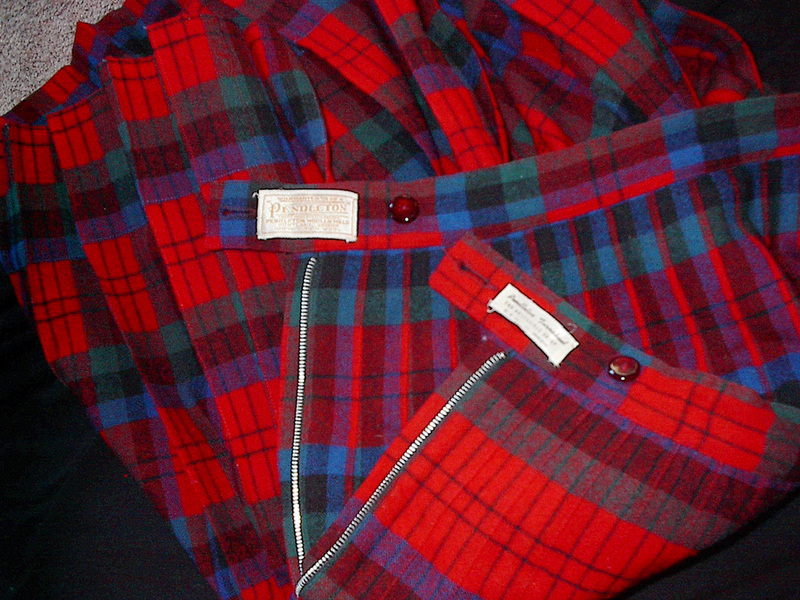 Some of the plaids were engineered so that you had a completely different skirt when it was reversed. Hello! So where can I purchase one of your lovely reversible pleated skirts from? Please make them again.!!! 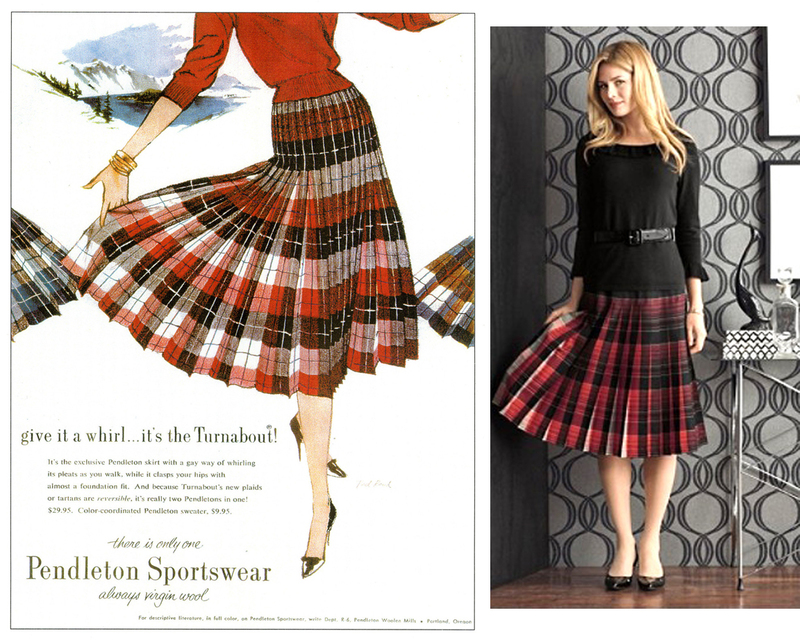 …I’m always looking for Pendleton Turnabout (Reversible) skirts.! Making one for each season for a year would be a cool idea; spring, summer, fall, winter, and holiday. 😎. Modernize the color pallets and patterns to suit 2017 and newer. Veronica, they are a true feat of engineering–and they use so much fabric! There are none in the plans for this year, but we will definitely keep them in mind for 2018. I’m a SA totally in love with these Pendleton reversible turnabout skirts. In SA we used to call them “Phendukas”for “Pantsulas” ladies, were smart but disappeared into thin air so we want them back! But we are worried about shipping its too expensive/free shipping please mam! My daughter and I found one at the local thrift shop for $5 and it looks brand new. Is there any way I could find out the age of the skirt? Michelle, if you send clear photos of the waistband tag to PendletonWM@penmills.com, we will do our best to give you the decade it was made. We have at least one coming this fall (after August of 2019)! This is our 70th year of Women’s fashions by Pendleton, so we are making sure to feature some iconic favorites. The Reversible Skirt is one of them. 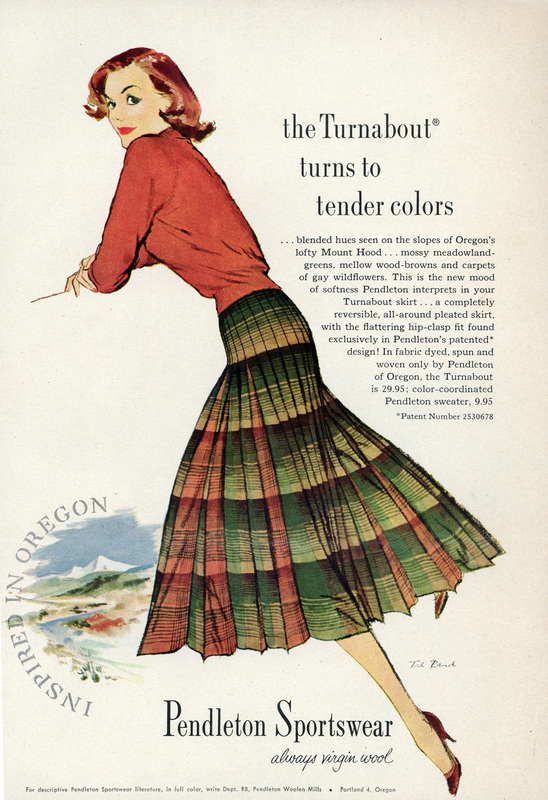 So so glad the Pendleton Turnabout Skirts are back again after August of 2019. I am sure your reply answers the question of what many women are waiting for.